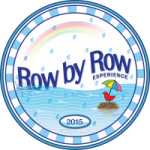 Sew What's New is happy to announce that both Sew What's New locations will be participating in the Row by Row Experience, so you have two opportunities to obtain a pattern to create your rows. You will need to visit each Sew What's New location (in person, sorry, no mail or phone requests accepted) to pick up your free pattern. We also have a limited supply of kits for these projects. How about this… it's like a shop hop, but it's not... no fees, no passports and all summer to play! Simply visit any of the participating shops and receive a free pattern for a row in a quilt. Combine your rows in any way to create a unique quilt that represents the fun you had traveling throughout the summer. Travel with friends, discover new quilt shops and have fun collecting rows! Create a quilt using at least 8 different 2015 rows from 8 different 2015 participating RxR shops and be the first to bring it into a participating shop to win a stack of 25 fat quarters (6-1/4 yards of fabric!). Use that shop’s row in your quilt and win a bonus prize!